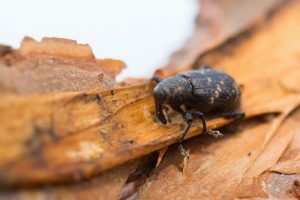 What can I spray for pine weevils? I have several small white pines showing damage up top. Aborist told me its the terminal leaders. Also finding them on the ground underneath. Pine weevils are one of the most damaging insects that target white pines. They will readily feed on Norway, Serbian, Scots, Reds, Jacks and other species too. 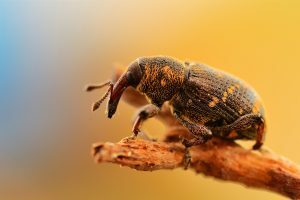 What makes pine weevils so devastating is they target young trees. In general, adults will target trees 20 feet tall or less. They’ll focus their work on the lead terminals of young trees laying eggs and feeding from spring through summer. 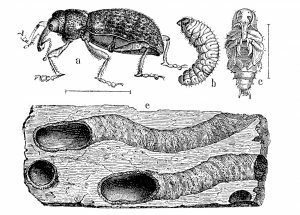 Pine weevils are robust and will overwinter on the ground underneath infested trees. On warm days they’ll fly up to leaders and feed. In spring, their damage is easy to spot but it will actually be damage that occurred the previous year. You’ll see withering terminals showing droplets of resin in new damage but it takes a full year for it to show as dead. This is the result of the puncture holes made by foraging females who feed and lay eggs in the wounds. 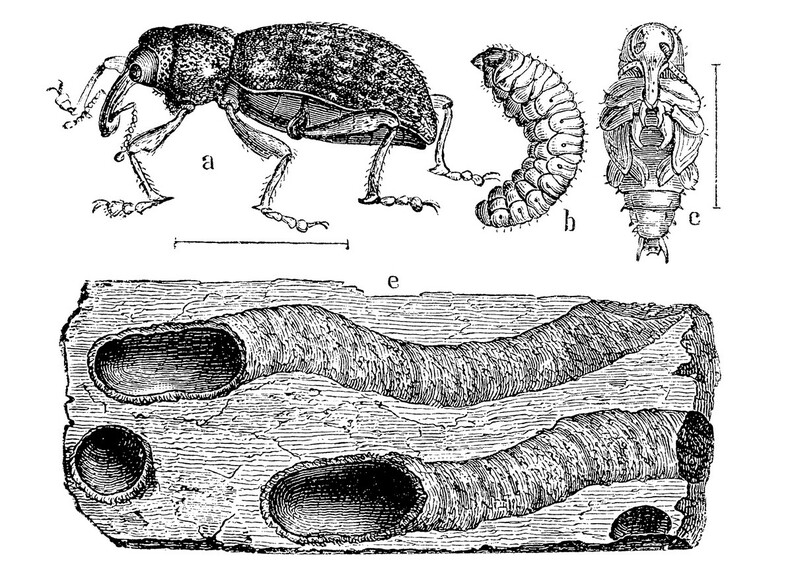 Hatching larvae will feed by eating the material just under the bark. This effectively hollows out the limb causing it to wither and fade away. Pine weevil eating fresh pine bark. In late summer, larvae will use their tunnels for chip cocoons where they pupate to adults who emerge in mid summer through fall. They’ll feed before overwintering but the real damage is done by the burrowing larvae. If you have young pine trees and want to ensure they don’t get targeted by pine weevils or other wood borers, spray them each spring with BIFEN XTS. It will absorb into the bark of the tree and offer both immediate control of active weevils as well as repel them for many months. One treatment per year will usually keep them safe. For active problems, spray twice in the first year to knock them out. 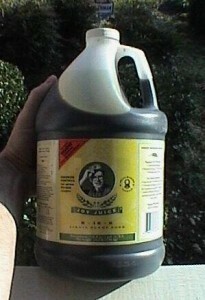 Add 1 oz of XTS to 3-5 gallons of water and for any tree 20 feet or less, plan on spraying 1/2 -1 gallon of mixed solution. 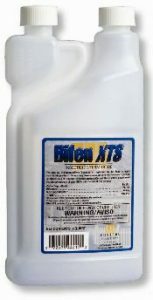 XTS will protect most any tree from boring pests and is a safe for use on all pine species. 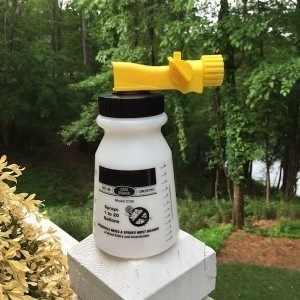 Use any standard PUMP SPRAYER to apply the mixed solution at the rate of .25 oz per gallon of water. This sprayer can reach 15+ feet up so the average person can attain heights of 20 feet when properly pressurizing the tank. For extra tall trees, consider using our 20 GALLON HOSE END SPRAYER. 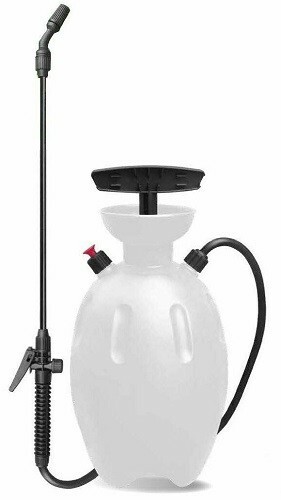 This sprayer has a 32 oz holding tank and connects to your garden hose. Using this high pressure, it can generally reach up 25-30 feet and will treat a lot of area quickly. Add 1 oz of XTS to the tank and then fill with water to the 5 gallon line. Use this amount on 5-8 trees 20 feet or less. 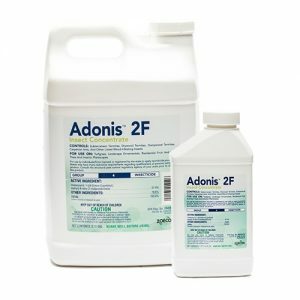 For added protection, treat every spring with ADONIS systemic. When applied as a soil drench around the tree, the active will get absorbed by the tree and then “grow” into the trees foliage. Pests targeting terminal pine tips will ingest the active when they feed and die. One application can last a whole year so its an easy way to get long term protection in place for stressed trees under attack. To drench effectively, you’ll need a large bucket or ideally, a 5 gallon pail. Fill the pail with 3-4 gallons of water. Next, add 1 oz of Adonis for every 10″ of tree width. Most trees 20 feet or less in height will only require .5 oz of Adonis. When soil drenching infected trees with Adonis, its a good idea to add our liquid fertilizer to the treatment. JOY JUICE will help revive your affected tree and promote healing growth. Use 1 oz per 10″ of tree, just like the amount of Adonis to use, and you can add it to the same bucket so you can do both treatments at the same time. We often get asked if suffering trees can be saved and the general rule is this. If your tree has been “brown” for 2 or more years, its probably dead. But trees showing damage for just 1.5 years or less can be usually be saved if given the right treatment and some food. Joy Juice is easy to apply, quick to absorb and you’ll know within 60 days if your effort is working. For damaged trees you want to save with Adonis, add some Joy Juice to the mix for extra insurance your tree will survive.